You don't need to know how to paint a portrait to paint a straight line. If you know how to draw a straight line then here is a great tip to paint a straight line. We get asked a lot about painting techniques to get lazer like painting lines. Practice makes perfect of course. But what if you are not a seasoned painting pro? Well don't worry here is one method that has seemed to help painting straight lines. Take out a pencil and sharpen it to a fine point. 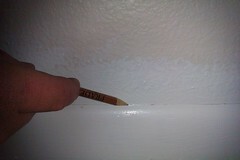 Then gentle lay the pencil into the corner and pull the pencil along the trim work, or corner, drawing a line. Now to achieve a professionally straight line simply trace the pencil line with you paint brush. One of the reasons why some may have trouble painting a straight line is because the corner is not obvious. We here things like this all the time: "I cant stop getting paint on the ceiling when I'm trying to paint the wall." Most can easily trace a line with paint. If you want to practice this method before trying to paint a straight line or "cutting" you can draw a line on the walls. Then cut a straight line until you feel comfortable enough to plunge into the trim work. You can also try putting a piece of tape on the wall and paint along side of it. The tape can be used as a straight edge. Don't paint the tape to achieve a straight line. The paint will bleed under the tape. If you are concerned about the dark graphite color showing you can draw a line with colored pencils. 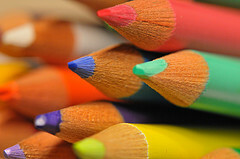 Simply choose a colored pencil that is dark enough to see and close to the wall color. That way even if you miss the line a tiny bit the colored pencil ine will not be noticeable. Now that's a great Khaki Pant Painting Tip! Every time i used to paint a line my hand started shaking and the line doesn't see to be line but after reading this article my confidence has been built up and i tried and it worked for me upto some extent but regular practice would make me pro.